We were recently given an interesting ‘HubSpot challenge’ by one of our clients. The client in question is an MNC that hosts multiple educational fairs and events around the world. They use the Enterprise version of HubSpot to handle over a hundred thousand contacts, multiple events and complex workflow routines (automated). In this given scenario, a single contact could attend multiple events and each event was associated with more than 20 event properties (data associated with the event). It is practically impossible to create and manage all these properties for every event in the “contact” module of HubSpot. Therefore, we decided to create and handle all the events in the “deals” module of HubSpot, as multiple deals could be associated with a contact and we needed to create only one set of properties for an event. Our goal was to send multiple email reminders based on the date and upsell other services of the client - from the registration of the event and afterward. A contact workflow centered on a date property was set-up to send multiple emails before and after the event date. However, we quickly realized that was not possible to put the event properties created in the deals module in emails that were used in the contact workflow. For this particular problem, we explored HubSpot’s recently introduced: deal workflows, which was in Beta version. 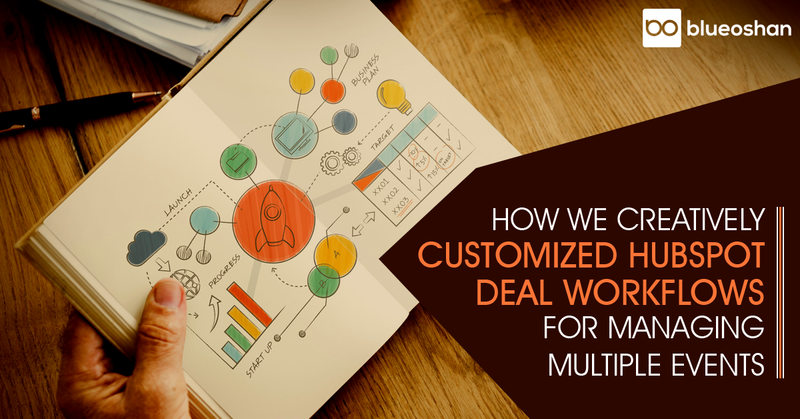 Unfortunately, when we set out to do this, we realized that there were limitations; unlike contact workflows, deal workflows cannot be set-up based on a particular date, cannot used with a segmented contact list, and cannot suppress contacts enrolled in other workflows. Due to these limitations, the conditions to send emails at frequent intervals could not be satisfied. After trying out various configurations to make this work using single workflow, one of my colleagues cracked the challenge. We simply broke up our workflow into multiple workflows There you go. It worked. We hope you found this case study useful. If you have any suggestions on how to solve a problem like this, we’d be happy to read your comment. We don’t often publish case studies on HubSpot, but if there is interest, we will post more. Our team is very experienced in HubSpot, so if you require any assistance, feel free to contact us.